I believe that equal access to a safe, reliable and affordable transportation network is a human right. My previous career was focused on helping working people and women of color, populations disproportionately affected by issues involving transportation. I work in this field because that must change. 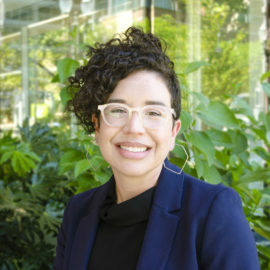 Marisa Trujillo DeMull holds a BS in Civil Engineering from Portland State University and a BA in Political Science and Religious Studies from the University of Colorado at Boulder. With a background in programming, planning, and engineering, Marisa strives for an inclusive and equity-focused approach to her design. She worked for 8 years as a political campaign director, organizer and long-range planner for labor unions. Her unique background gives her the ability to take a creative approach to projects. At her previous firm, Marisa worked as the resident “Plangineer”—taking on projects from detail curb ramp design to authoring multimillion dollar FASTLANE grants. She is an engineer in Alta’s Portland, OR, office.